I don’t know about you, but in my house, come January 1, the kids are still on break, we still have more sweets than I’d like in the house and my routine is all but non-existent. But when they go back to school? GAME ON! So now that Christmas and the New Year have come and gone, I’m ready to face 2019 with excitement and make it the best year yet – are you? Eliminate toxic chemicals from the house… DONE! Clean only with non-toxic, essential oil-based products… DONE! Eat only organic chicken and grass-fed beef. DONE! Grocery shop the same day every week. DONE! Re-visit making foods from scratch. DONE! Include grocery shopping online. DONE! As you can see, I made a good bit of progress on several of these goals! As I was considering my new year goals for 2019, some of these previous goals will roll over – especially the ones that are done-ish, and there are new ones too. I wonder if this organic cleaner is really healthy… it sure does have a strong smell! I wish I had put these leftovers in glass containers… I don’t want to microwave in plastic, but I don’t want to dirty another dish! Buying tortillas doesn’t happen that often… yet I can’t remember the last time I made them either. Do you ever have those types of thoughts? These are the things you should add to your list of goals for the year. 1. You need a “why.” WHY do you want to reach that goal? It doesn’t have to be grandiose, but it needs to mean something to you otherwise you have no skin in the game. You want to lose 10 pounds SO YOU CAN fit into your jeans again? Great! You want to eat healthier SO YOU have more energy? Perfect! Whatever your “why” is, make sure you attach it to your goal. 2. You need a game plan. Essentially, HOW are you going to achieve that goal? Writing “eat healthier” as your goal is great, but HOW are you going to do that? Are you going to eat salads for lunch every day? Are you going to start each morning off with a high protein smoothie? 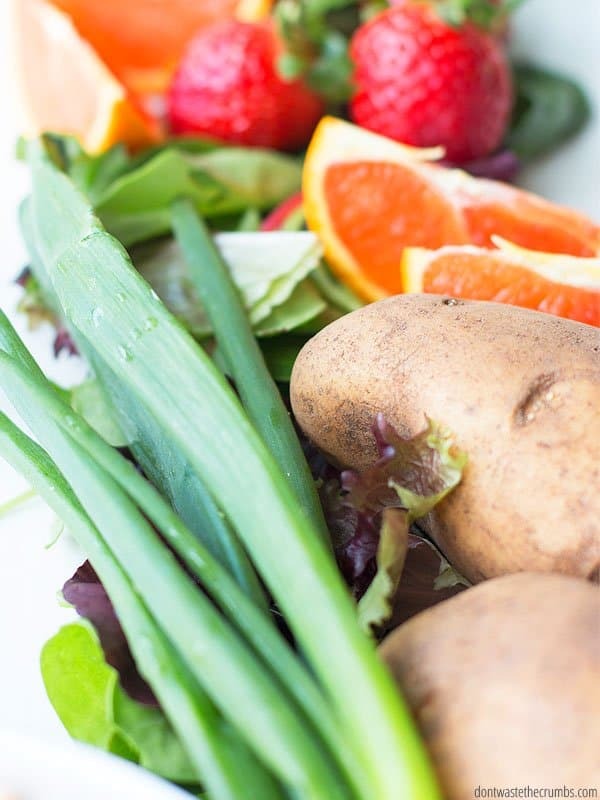 Are you going to include at least three vegetables at the dinner table every night? Take your goal and think of three small steps you can take to reach it. If your goal is really big, you might have to take those small steps and break them down even more, but for most of us, just writing down HOW we’re going to get to that goal is enough to point us in the right direction to actually REACH that goal. The whole point of making goals is to make change, right? So let’s pick things that will actually do that!! I’m including my 10 new year goals for 2019 below. If you need ideas, you can read my goals from 2018 and check out this post of 52 baby steps! Goal #1: Eliminate plastic storage containers. Why: Simply put, it’s too easy to put a plastic container in the microwave. Why bother moving to a plate just for more dirty dishes? I also put hot foods in plastic containers, which concerns me too. What This Will Look Like: The fact that my family went back to the plastic containers told me that I didn’t have enough of the right sizes. I plan on pulling out the plastic containers they reached for, seeing what shape they are, the capacity of how much they hold, and taking into consideration HOW these containers are most often used. Then, I’ll find a suitable replacement for them on Amazon (so I can pay for it using Swagbucks!). Goal #2: Switch from modern wheat to ancient einkorn whole wheat. You’ll notice that #4, #5 and #6 are done-ish. That’s because last February, we did the Whole30 and eliminated all grains by default. We added non-gluten grains back in around summertime, and when we realized that the family can tolerate einkorn, we added it back in the fall. Why: Two of the four people in my family don’t tolerate the gluten in modern wheat well at all. It gives my daughter migraines and it makes my husband feel very jittery. Neither have an official allergy to it, but we’ve tested it over and over again and have concluded that the trigger is always gluten. At the same time, we love homemade breads and muffins and cookies and going grain-free is VERY expensive! Since we tolerate einkorn well, there’s no reason why should shouldn’t include it in our diet. I’ll also have to learn how einkorn behaves differently in baking recipes, besides the “reduce liquid by 25%” rule because not all recipes have liquids to reduce! I’ll be sure to keep y’all updated. Goal #3: Learn how to make einkorn sourdough. Why: My gut tells me that einkorn sourdough is one of – if not THE healthiest wheat-based bread you can make. And since we’re switching to using einkorn exclusively in baking, I want to master einkorn sourdough! What This Will Look Like: I plan on enrolling in Traditional Cooking School, taught by my friend and colleague Wardee. She is THE MASTER of all things traditional food and einkorn sourdough is no exception. I’ll be recording what I’ve learned through blog posts and on Facebook, so definitely stay in touch – subscribe to the Crumbs weekly newsletter to stay in the loop! Goal #4: Do more freezer cooking. Why: I was intentional with freezer cooking this past fall – focusing mostly on school breakfast items like 5-minute banana bread muffins, a batch of chocolate waffles and breakfast sausage– and I’ve REALLY enjoyed the freedom it’s given me. Our mornings are SO much smoother! Plus my kids are old enough to be able to re-heat a muffin or sausage on their own, which allows me the opportunity to shower before we leave for school! What This Will Look Like: I plan to learn from others who are considered experts in the field, like my friend Kelly from The Freezer Family. I consider myself well-versed in freezing single items like brown rice or beans or simple marinade recipes, but freezer whole meals baffles me! She has a plethora of tried-and-true recipes in her cookbooks, and going forward, I’m including at least one freezer meal in my weekly meal plan. Goal #5: Dedicate one-hour meal prep sessions at least twice a month. Why: I’ve done meal prep sessions on the weekends before, and I’ve reaped the benefits of having basic meal staples ready to go for dinner! However, I haven’t been intentional about it and that means that some weeks I’m really pressed for time because I’m having to make everything from scratch, every single night. I’d like to have dedicated sessions each month where I can consider what foods we eat the most of, make them ahead of time and stick them in the freezer for later. What This Will Look Like: I’m actually publishing some of my adventurous in this on the blog! Each month I’m writing a specific meal prep session and then carrying it out on Facebook LIVE. This will count as one of my own meal prep sessions, and then I’ll have a second one that I do on my own time. The one I do on Facebook LIVE will happen on Fridays, but the second session will be either Saturday mornings or Sunday afternoons when I know I have an extra hour to dedicate to this, and when we don’t have any family commitments. Here is a link to the first session I completed, One Hour Freezer Cooking: Breakfast. If you want, you can print the shopping list and recipes and follow exactly what I did! And here is the Facebook LIVE video. Feel free to watch the step by step process! Goal #6: Eat out the freezer. Why: We’ve been in our house for two years now and I haven’t emptied the freezer yet. I want to change that! We have things in there that are OLD (i.e. cranberries from two Thanksgivings ago), and I want to make sure I’m stewarding the food we have well and avoiding food waste. What This Will Look Like: I will have to make a point to use what we already have on our meal plans by taking inventory of what I have and using that sheet as I plan my meals. I’ll also have to temporarily avoid stocking up on markdowns and avoid the meat section altogether at the grocery stores. I currently have a subscription from Butcher Box, so I get organic and grass-fed meat delivered each month, so there’s no reason to have to buy in addition to that! Right now get 2 lbs of ground beef + bacon + $10 off your first order from Butcher Box! Goal #7: Eat more beans. Why: Beans are cheap, packed with nutrition and are a great way to stretch a grocery budget. Several years ago we were VERY intentional about eating beans at least once a week. Somewhere along the way we got sidetracked, and doing the Whole30 (that eliminates legumes) didn’t help. What This Will Look Like: I will include beans on our dinner meal plan at least once a week, and include them as a snack at least twice a month. The kids really like 5-minute chocolate hummus and black bean brownies, so I’ll probably start there! Goal #8: Meal plan on Sundays, shop Walmart/Kroger on Mondays, Sprouts on Wednesdays, Costco every other month. 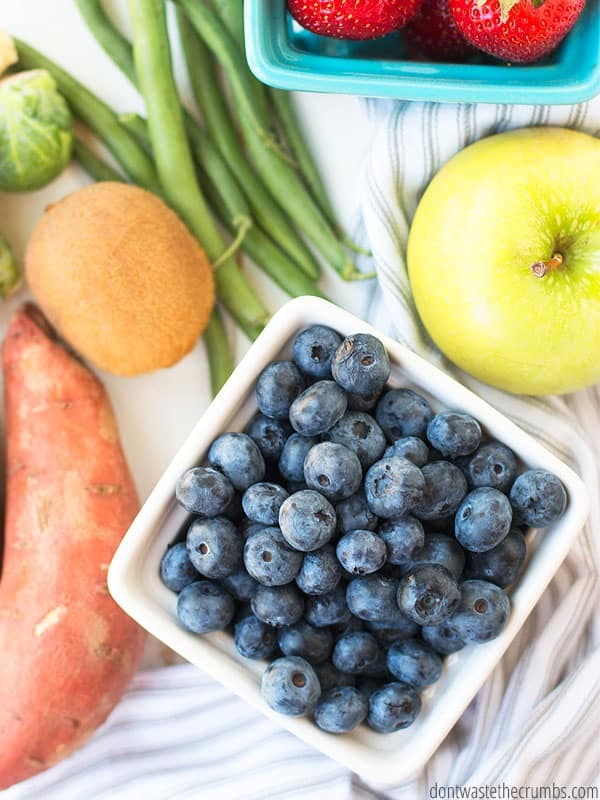 Why: Since doing the Whole30, the amount of produce we consume has sky-rocketed. I’m finding that Kroger’s prices are just so-so and Walmart doesn’t have a huge selection. I’ve been testing Sprouts these past few weeks and I *think* I’ve found a way to make it work. 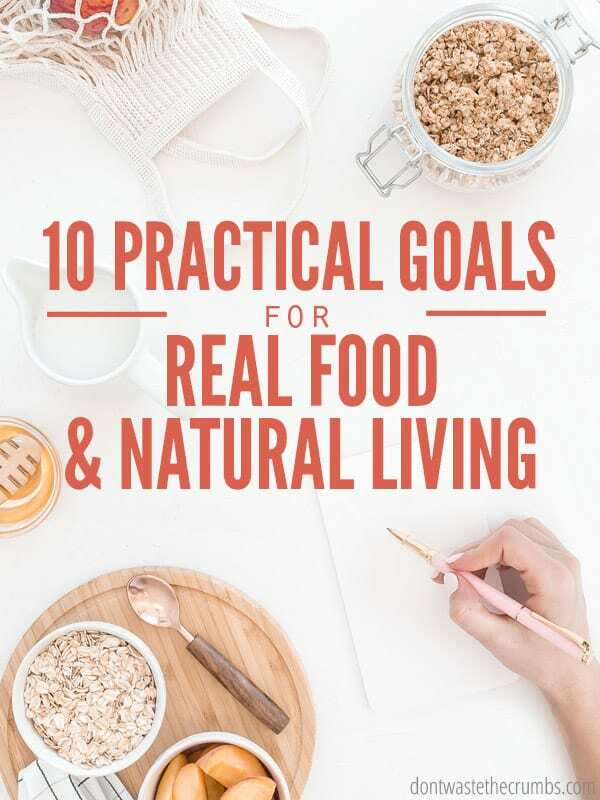 Goal #9: Have a pantry challenge. Why: We cleaned out the pantry after finishing the Whole30, but pantry challenges are more than just getting rid of the bad stuff – they inspire creativity and stretch us beyond our normal boundaries. Plus they help us save money! What This Will Look Like: I’d like to have a one-month pantry challenge this year, probably either in June or in September, depending on our summer plans. June is a great time because it’s halfway through the year, but then I always feel the urge to purge when the kids go back to school in the fall. I’m not sure which it will be, but it’s going to happen! Goal #10: Have a no-spend challenge. Why: It’s been several years since we’ve had a no-spend challenge, but this is something my husband and I have wanted to do since moving into our house. What This Will Look Like: Realistically, this will help us meet goal #7 and goal #8, so it will all probably happen at the same time. Maybe sometime this summer? Or in September when the kids go back to school? I’ll have to look at our calendar to make sure our family commitments fall in line with the rules of a no-spend challenge before committing! So there you have it – these are my ten new year goals for 2019. What are YOUR new year goals for 2019? Leave them in the comments section below so we can cheer you on! I’m pretty disappointed that everything so far that I’ve tried to do on Swagbucks wants my birth date. I don’t want to give out any of that information, so I bypass those surveys, etc. I could. It concerns me though if you read the terms of service, they say they can share all your information including credit card information. I guess if you don’t buy anything you’re ok. But I sure wouldn’t want things like that shared! Hi Tiffany! I recently found your website and am loving catching up on all this good information! I am curious which of your experiments over the years have ended up passing the test of time? Do you still use collagen and maca in your smoothies? Do you still make your own yogurt? kefir? ACV elixir? How often do you detox? 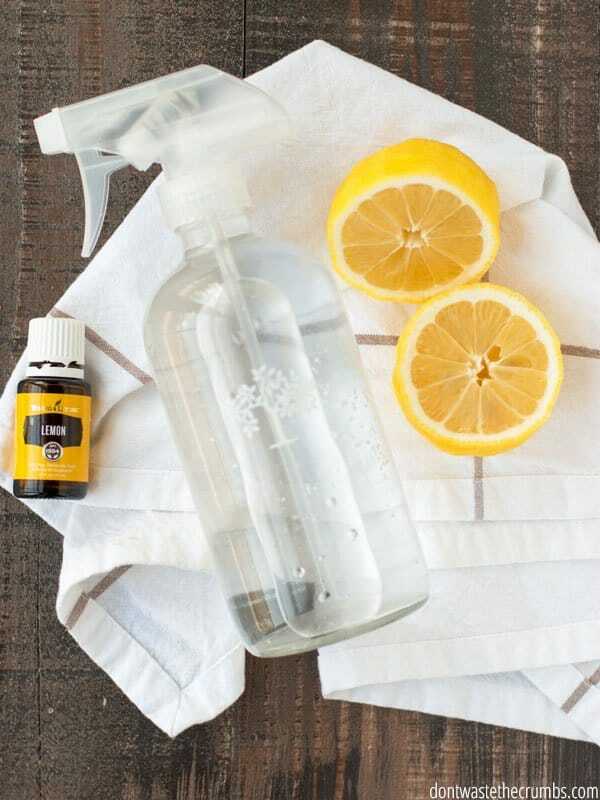 Have you found it better to make your own cleaning supplies or just buy Young Living? My first baby step to natural living was getting the Bend Goat soap and it is making my skin so soft so now I’m trying to decide which to try next! Hi Jill! This is such a good question! Collagen – absolutely!! Every day I add a scoop to either my smoothie or my tea. Maca – I cut back on this when I found better relief from essential oils. Yogurt – no because we’ve greatly cut back on our dairy consumption. It just didn’t make sense to make so much when we didn’t eat it very often. Kefir – no, for the same reason as yogurt. also because my grains died when we moved from CA to GA.
ACV elixir/Detox – as needed! usually early summer and after Christmas is when I feel like I need a break, lol. Cleaning supplies – both. I use YL’s Thieves Household Cleaner for all of my cleaning, but I enhance it to make other things like dish soap or a shower scrub. It comes out to 37¢ per 16 oz, which is pretty hard to beat even if I were to make it entirely from scratch! Goat milk soap is a FANTASTIC first step! Looking back, getting a good all-purpose cleaning would have been a great next step because it would replace so many other things in the home. Dryer balls are also a good step! I just discovered your blog and love the ideas that you have for doing healthy eating and living on a budget. Thanks for all the work that you put into this. Only one thing regarding this particular article – we have stopped using a microwave all together. I agree that glass containers are best and that’s my goal too! 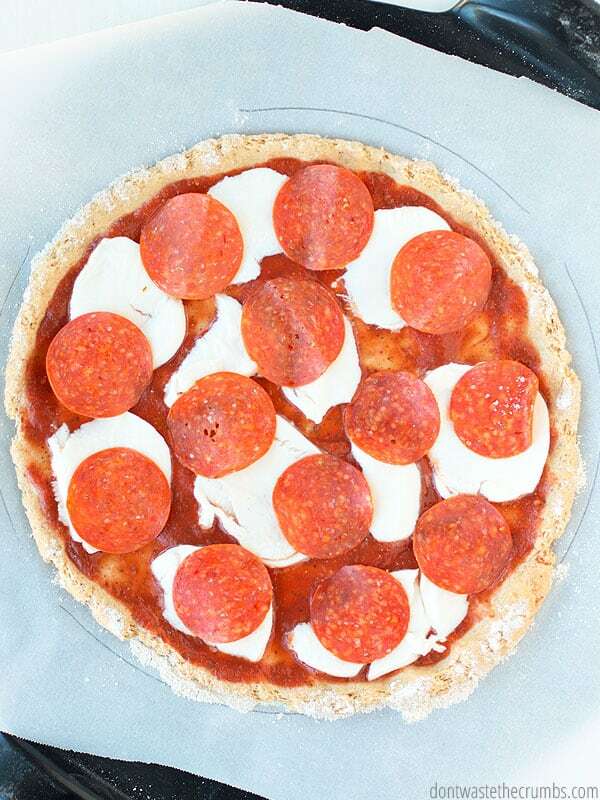 Glass can easily be put into the oven for reheating! Microwaves can be detrimental to the nutritional content of the foods.